Amazing 5,100 Sq. feet Sunshine Coast Waterfront Estate in Gibsons on two and a half park-like acres sitting on a combination of low and medium bank waterfront and forested property. Gorgeous unobstructed views of the North Shore mountains from the 5 man Hot Tub situated on a very quiet and peaceful point in front of the property. 6 large bedrooms and bathrooms, including a very luxurious master bedroom with spectacular views out to the scenic West Coast vista.Walk down the stairs to one of the nicest beaches on the coast. The house sits on 2 1/2 private acres with plenty of natural places to put up a tent and enjoy the west coast while camping as well. This photo of Jen and I is at the waterfall in the bay on our property. I have lived on the Sunshinecoast for most of my life. When the chance came to buy this property I was very fortunate to be the one to get it. I have fished cod (best cod fishing in the world) off the rocks right in front of the house when I was 10 years old. There is no place like Langdale. Very Large 6 Bedrooms. Very Private 2 and 1/2 acres of land with 900 feet of waterfront. 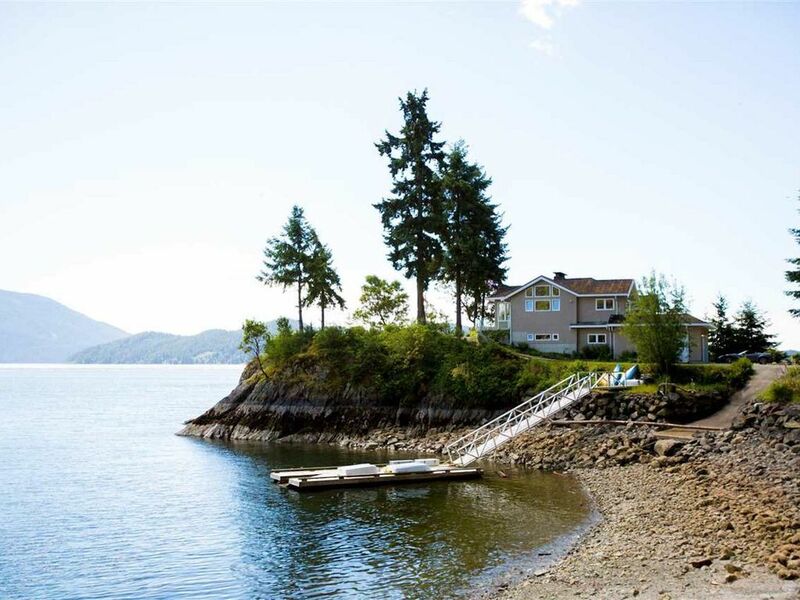 The property looks like you are sitting on your own private island yet the driveway is only minutes too the ferry terminal and 7 minutes too the village of Gibsons.The crabbing and swimming are the best on the coast. We have a third shower off the second bedroom upstairs. The house is on the ocean. Six person on the waters edge. The home was beyond incredible. It was fully equipped, and secluded, allowing you to feel as if you are on your own island. The home accommodated us all very comfortably, and everything was very easy to find! The best part was our host John who was more then accommodating to my friends and I! He encouraged us to feel at home, and we did! The entire experience was exceptional! I highly recommend this home, and I will most definitely be back! Thanks for the kind words Hayley. Good location. As described. Responsive host. Nice house on the water. Lots of room. Well equipped. Responsive host. Great gathering place for large family at Christmas! Large home on ocean with great views. Facilities as described in listing. Responsive host. We couldn't have been happier with our rental this labour day weekend. For a group of friends it worked perfectly. We had two boats that easily fit on one side of the massive sheltered dock allowing for swimming and hanging out on the other, the phosphorescence at night was an unbelievable experience especially for those that had never seen it before. The bedrooms offer a great variety of ridiculously comfortable single/double bed configurations for couples and friends to get some quiet and privacy. A well stocked and labelled kitchen made cooking for a group easy and would satisfy the utensil and appliance needs of any chef, and the BBQ on back deck off the kitchen made prep seamless and out of the way of activities on the front lawn. John was a great host offering all the information you need and was a great truly local sunshine coast resource! Thanks for having us! Lovely clean home. Was great for all 13 of us-plenty of space. We had a lovely time and John was very helpful. The house is in a lovely location on the water. Beautiful views. The internet was not working but John did his best to get it sorted. Thanks John ! This is the first review that was not 5 star. John works very hard for all of our guests and is surprised that he didn't do enough for your group. He has told me that the internet worked fine upon your arrival and that after many hours trying to fix it the Telus tech had found that someone in your group had unplugged it to use a charger. John spent 6 hours to make sure you had internet and from what I understand you did. I also understand that John had brought your group 2 smoked sockeye salmon that he personally smoked himself for you to enjoy. He also borrowed 2 kayaks from our neighbour for your group to use while at the house at no charge. John let your group use our boat as well with the understanding that a bottle of scotch would be left for his most generous gesture. I understand that there was none left. He said that apparently there was a leak in the boat but when he took it for repair the mechanic simply laughed and put the plug in properly. Fun fact , From the very start he brought in an extra cleaner to try and get the property ready for an early check in for your group and you never showed up till after 8. I think you will agree that when we arrived to set up the property for the next group you guys had not packed and left the house. Our agreement states that there is a charge for a late checkout but John said not too charge your group and we worked around your family. I certainly do not want too go on but I know how accomadating my husband is to our guests and although he would never say I know he took your review to heart as he really liked you guys. Amazing spot! Hosts were super helpful and accommodating. We had a family vacation here with 14 people. Loved the location, catching crab for dinner, nearby hiking, and the views! House is super comfortable, and kids found tonnes of stuff to keep them busy and away from screens. Great kitchen, and John was a terrific host. Plus Gibsons is a cool little town with good eats. So that’s a bonus! Only drawbacks are that it wasn’t possible to access the nearby sandy beach by foot - so that’s kind of a tease! And only two showers which was a little light for 14 people. Thank you for your kind words Mark. It was a pleasure to host you and your family.I must say in all fairness we actually have 3 showers and will be installing a fourth in the downstairs bathroom. Thank you so much for the respect that you showed for our property, it was much appreciated. There is an abundant opportunities to enjoy nature close up. Excellent Golf, Fishing, Hiking, Mountain Biking, Restaurants, Brew Farms and live musical entertainment.